Weigh in and get rewarded each week for sharing the styles you love! This week’s contest: Post fashion photos of your favorite brands to your My Wire feed. The contestant with the most likes and swipe rights for the week wins an item from the FashShop store. So get posting, and good luck! Please note: Apple is not involved in any way with the contest or sweepstakes. The Fashwire Rewards program is intended for personal use only. Commercial use is prohibited. This program is not targeted towards, nor intended for use by, anyone under the age of 18. No purchase is necessary to enter into Fashwire weekly rewards. All participants must be permanent residents of the United States. All participants must be at least 18 years old to be eligible to participate in the Weekly Rewards. One entry per household will be permitted to participate in a contest. A “household” is defined as any individuals residing at the same address. After winning the contest on Fashwire, the individual/household is ineligible to win any other contests on Fashwire for a period of thirty (30) days. Prizes must be claimed by the winners on the Fashwire website within thirty (30) days of notification to the winner. Otherwise, failure to pick up the prizes by the deadline will result in the forfeiture of the prize, which shall remain the property of Fashwire, Inc.
As a condition of entering a contest, Qualifiers must agree that upon winning, they will consent to the use of their name, likeness, and all verbal and written communications with Fashwire for publicity purposes. Employees of Fashwire, Inc. and their advertising agencies, affiliates, contest sponsors, employees and immediate families of each are not eligible to win any contest. Immediate family includes the spouse, great-grandparents, grandparents, parents, brothers, sisters, children, grandchildren, and great-grandchildren of the employee and his/her spouse. This also includes individuals for whom the employee is current legal guardian. All prizes are non-transferable and are not redeemable for cash. Fashwire reserves the right to substitute a prize of similar value. Fashwire cannot be held responsible for unforeseen cancellations or delays of concerts/events or transportation caused by weather, promoter or performer. Fashwire assumes no liability for liability, damages, situations, repairs, or incidents arising from any aspect of any prize awarded in any contest. Fashwire, all participating co-sponsor companies and their advertising and promotional agencies, affiliates thereof, employees, and immediate families of each absolve themselves and shall be held harmless from any action or liability arising from any contest or prize awarded in any contest. As a condition of entering a contest, participants may be required, upon winning, to sign a release form and affidavit of eligibility to claim their prize. Failure to do so will result in forfeiture of the Qualifier’s right to claim or receive the prize. All appropriate information in required fields must be filled out or Qualifiers will be disqualified. Any problems with the internet or email are not Fashwire responsibility. Qualifiers who attempt to register to participate on Fashwire websites may be required to produce a printed copy of proof of registration before being allowed to participate in the contest. All giveaways and contests are void where prohibited by law. All local, state and federal regulations apply. Fashwire reserves the right to interrupt and/or discontinue any contest or promotion (and not award the offered prize) at the discretion of Fashwire management if world events, the national mood, or public safety so warrant. Fashwire reserves the right to disqualify any winner if the contest rules have been violated in any way. Fashwire reserves the right to amend the rules to any contest at any time. All decisions of Fashwire are final. Although Fashwire will make reasonable efforts to conduct its contests substantially as announced or advertised, Fashwire reserves the right to change or modify the rules of its contests as exigent circumstances may require. In such cases, Fashwire will amend the rules for that contest and broadcast the amended rules as promptly as possible. In such case, the contest will be conducted in accordance with the amended rules. A copy of these rules is available during business hours (9:00am-4:00pm Mon-Fri) at the Fashwire studios, 3308 West McGraw Street, Seattle, WA 98199. 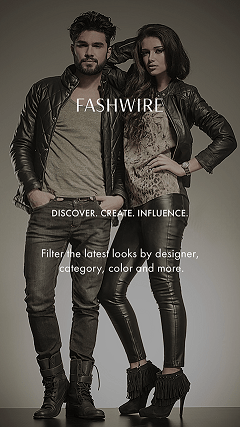 To participate in Fashwire Rewards, click on the ‘My Wire’ tab on the Home Screen of the mobile app. Click on the + sign in right hand corner and you will be given a prompt to post a Lookbook or a photo. Once you post, the users that follow you can ‘Like” your post. The most “Likes” for the week wins the weekly reward. The weekly rewards runs Sunday to Sunday each week. Every Monday, the winner is announced via email communication. The Fashwire Reward is an item from the Fashwire store or a Gift Card from Fashwire. There are no membership fees associated with Fashwire Rewards. Likes accumulated under the program are promotional and have no cash value. Your Likes and your account under Fashwire Rewards are personal to you and may not be sold, transferred or assigned to, or shared with, family, friends or others, or used by you for any commercial purpose. You may have only one (1) Fashwire account that is personal to you to get Rewards. Fashwire reserves the right to terminate, discontinue or cancel the Fashwire Rewards program at any time and in its sole discretion without notice to you.